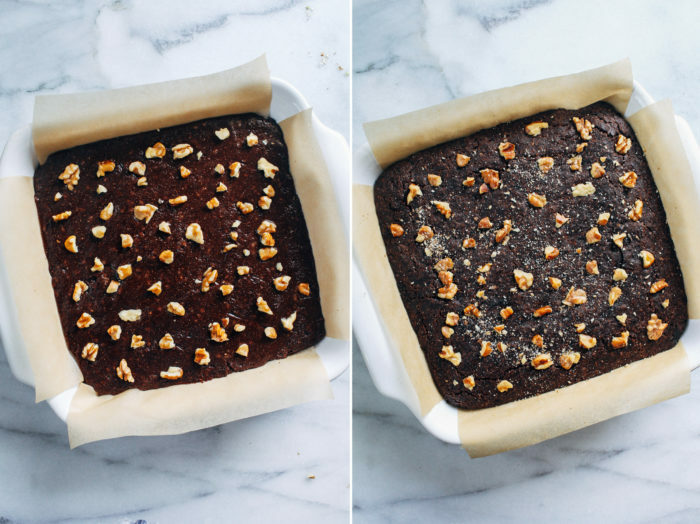 Ella’s Fudgy Brownies– adapted from the new cookbook Deliciously Ella, all you need is 8 wholesome ingredients to make these scrumptious vegan brownies! 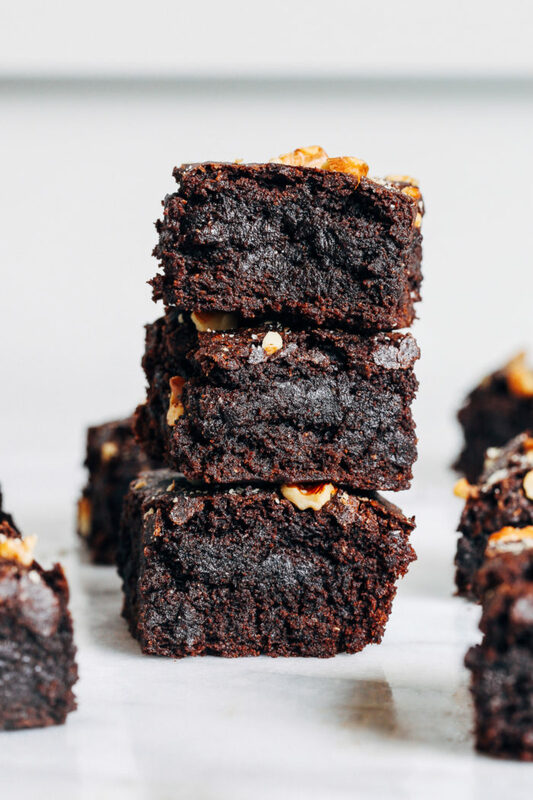 We have an ongoing debate in our house and I need y’all to weigh in for me…do you like your brownies with or without nuts? I’m a nutty girl all the way but Brandon despises them in his brownies. I just don’t get it. Because of this debacle, I usually make half with and half without to please us both. But not this time, mwuahaha. This time I had an excuse since I was reviewing a recipe from the new cookbook, Deliciously Ella. Ella makes her famous fudgy brownies with walnuts on top so obviously I had to do the same. 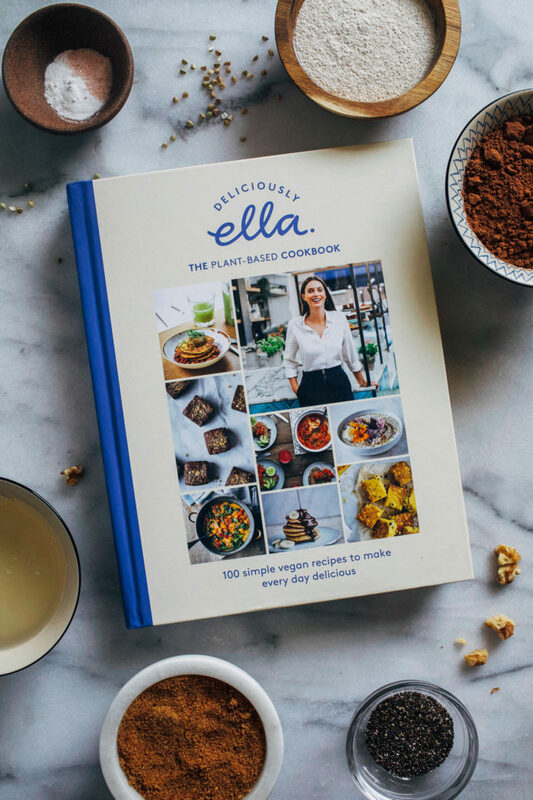 What I love about Ella Woodward’s new book (besides the fact that she puts walnuts in her brownies) is that all of her recipes are simple and approachable, making it great for someone who is new to plant-based cooking or just those on the hunt for quick an easy meal ideals. Which is kind of all of us, right? One ingredient you’ll find in many of her baking recipes is buckwheat flour. I’ve tried many different brands of buckwheat flour and I have to say that the results vary quite a bit depending on the brand you use. The flavor is much stronger than regular wheat flour and it can be off putting depending on the brand. 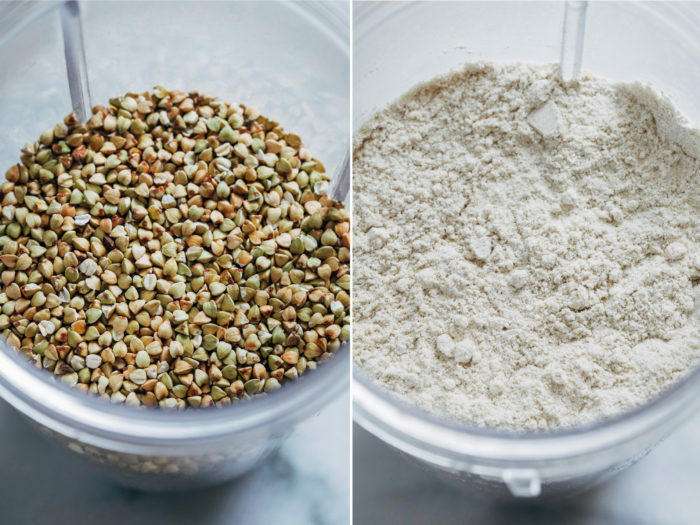 I’ve found the most consistent results with making my own flour from raw buckwheat groats that I find in the bulk section at my grocery store. All I do is blend it up in my NutriBullet and it’s good to go. 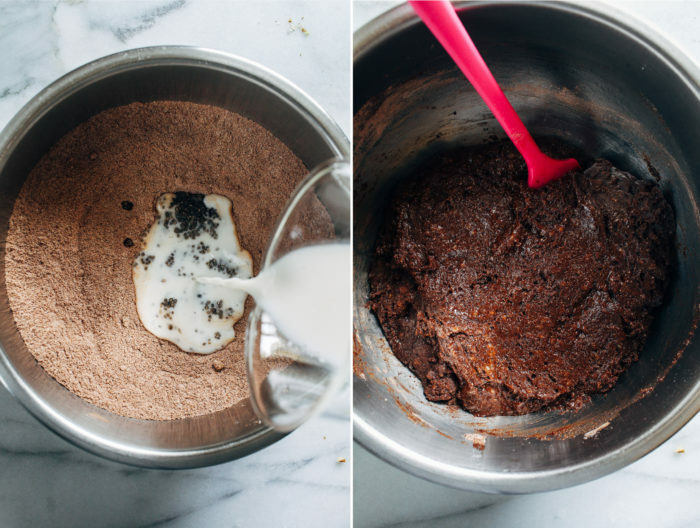 Chia Seeds mixed with water create a “chia egg” which helps bind and leaven the brownies. 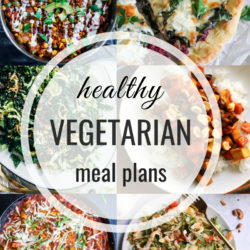 They also add a boost of fiber and omega-3 fatty acids. Buckwheat Flour is the main base of the recipe. Not only is it naturally gluten-free but it’s also high in fiber, magnesium, and antioxidants. 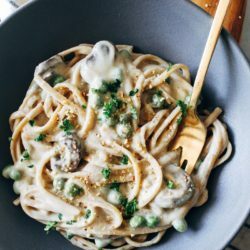 I haven’t tried substituting with other flours but my suspicion is that oat flour, wheat flour, or possibly quinoa flour would work in it’s place. Baking Soda and Sea Salt help leaven the brownies while balancing out the sweetness. Cacao powder (or cocoa powder) give them their rich chocolatey flavor. 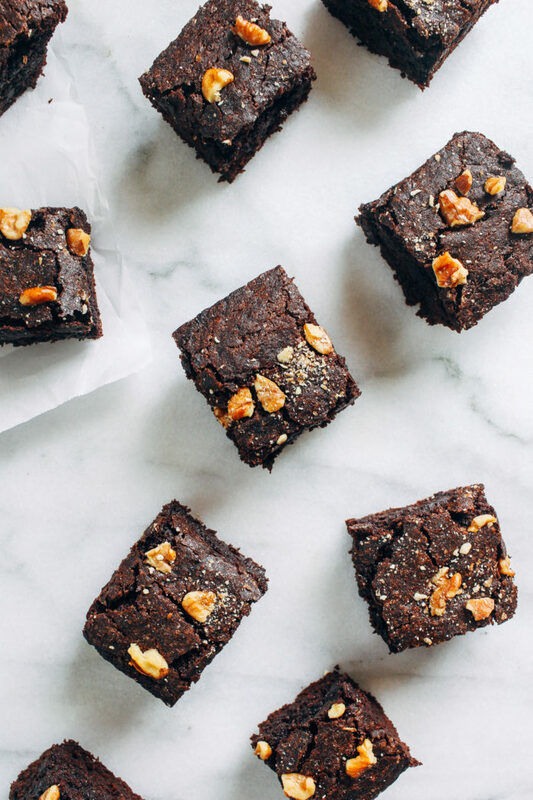 Coconut Sugar is what makes the brownies taste sweet. The original recipe calls for 330g but I reduced it slightly to 1 and 1/2 cups. Coconut Oil yields moisture giving them their fudgy texture. Almond Milk also provides moisture and can be easily substituted with your favorite non-dairy milk. To start we make our “chia egg” by stirring together the chia seeds with water. Then we whisk together our dry ingredients: buckwheat flour, cocoa powder, coconut sugar, baking soda and salt. 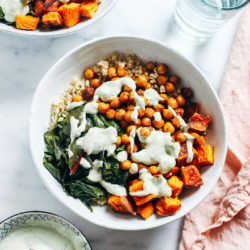 To the same bowl, add the wet ingredients: chia egg, almond milk and coconut oil. Stir together until a batter forms. Spread the batter in the baking dish and bake for 25-30 minutes. That’s all there is to it! While the buckwheat flour gives these brownies and earthier flavor than I’m used to, the texture was perfectly rich and fudgy. I highly recommend them as a healthier treat. 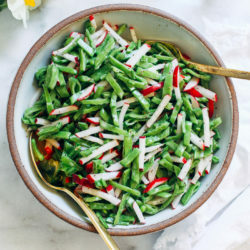 For more incredible plant-based recipes, be sure to get your hands on a copy of Deliciously Ella. 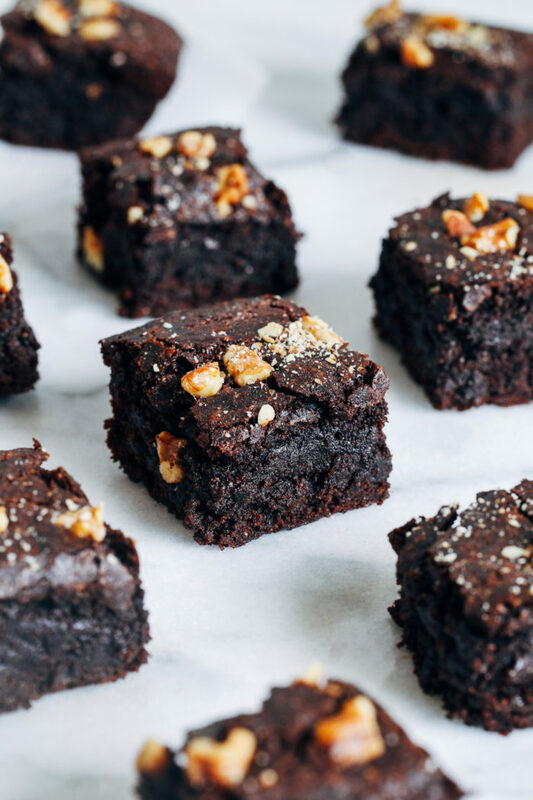 Adapted from the cookbook Deliciously Ella, all you need is 8 wholesome ingredients to make these scrumptious vegan brownies! Preheat the oven to 375°F. Line a 9x9" baking dish or pan with parchment paper and set aside. In a small bowl, combine chia seeds with 4 tablespoons water. Stir to combine and set aside for 10 minutes to thicken. 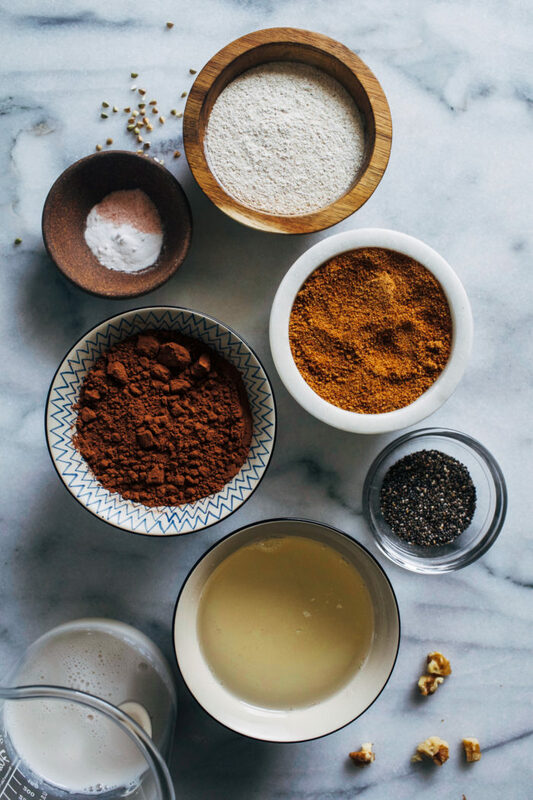 In a large bowl, whisk together the buckwheat flour, baking soda, cacao powder, and coconut sugar. Add the chia seeds then pour in the almond milk and coconut oil. Fold together until ingredients are thoroughly combined and a moist batter forms. Spread the batter out in the line baking dish so that the top is level and are sides are even. Sprinkle chopped walnuts on top. Bake in oven for 25 to 30 minutes, until edges are crisp but center is still a little fudgy. Allow to cool in the pan for 10 minutes. Transfer to a cooling rack, cut into squares and serve. Leftovers can be stored in an airtight container for up to 3 days. Oh my gosh those look so good! 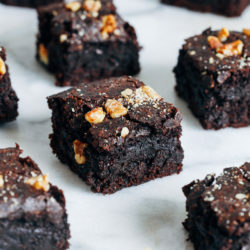 These brownies do look nice & fudgy! I was craving brownies a few weeks ago and had the perfect excuse to make them because we were having company in town. I’m so intrigued! 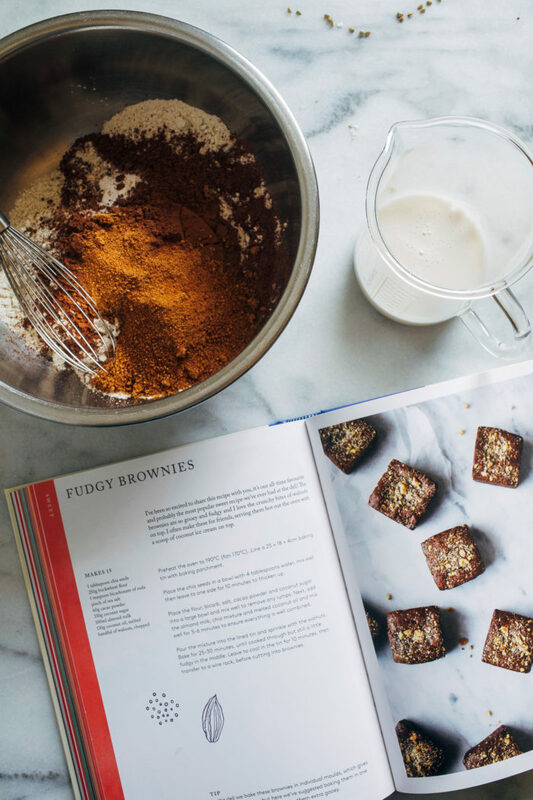 I would have never thought to make brownies with buckwheat flour, but these look delicious! 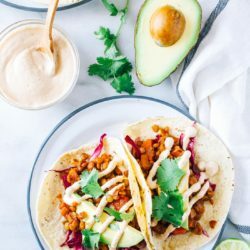 I love Deliciously Ella! Cool that you are collaborating with her!